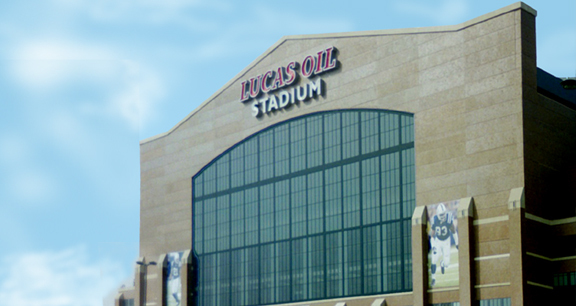 Project obstacles and solutions: Hagerman Construction was contracted to supply the footing package for Lucas Oil Stadium. This called for 40,000 yards of concrete, or over 300 yards per day for six months. This also included four concrete pillars to hold up the retractable roof. Each pillar is 15' thick, each made from 1,200 yards of concrete. Since the pillars anchored the steel beams attached to the roof, the variances were very tight. Each pillar had 120 bolts, each 9' long and weighing 180 lbs, that had to be poured in place to fit the steel beams which were manufactured and shipped in from Luxembourg. Each pillar had to be designed to tie the steel down without any gaps. The other obstacle was making sure the strength of each pillar met engineering specs of 7,500 psi. The concrete temperature had to be controlled to alleviate any thermal cracking as it cured. There could only be a maximum variance of 40ºF external–internal temperature during the two weeks that the concrete cured. To further complicate the project, the pour occurred in the cold month of February. The IMI design team used a low-heat hydration method and concrete was cold mixed (delivered to the site at 40ºF.) As it cured, the core temperature never exceeded 160ºF and the external temperature was controlled to match this mark. Hagerman monitored the temperature every hour around the clock. Blankets were used to adjust the external temperature. Test showed that the concrete reached a strength of over 14,000 psi, almost double the specs. "You cannot beat the IMI design team," stated Darrel Tacket from Hagerman Construction. "No one in Indiana has the technical data to back us up like IMI."